The PE curriculum for Classes is informed by the National Curriculum. Because of the school’s resources, and the individual needs of the pupils, the requirements of the National Curriculum are often modified and in some cases, significantly enhanced. The school is blessed with its own learner pool and qualified full-time instructor. Consequently our pupils experience more swimming tuition than their mainstream counterparts. Generally one hour timetabled pool time for Primary Aged children each week, and 1 hour for pupils of secondary age. 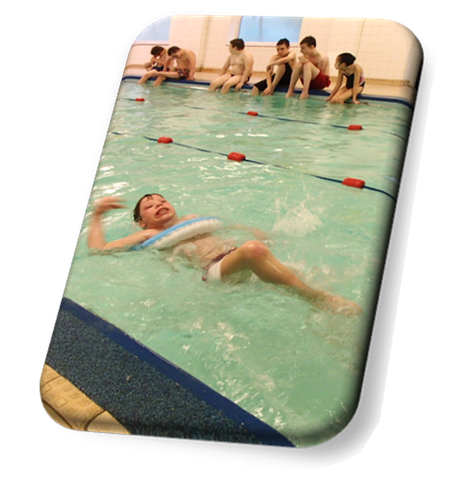 Pupils in Class 6 (students who are developmentally young, or have profound and multiple learning difficulties) receive up to 2 hours swimming every week. In all cases, pupils are accompanied to the pool by two or more experienced teaching staff, who generally supervise changing and assist with the lesson. The teacher in charge of the class retains the Duty of Care for all pupils at the pool throughout the lesson. Some of our FE students are also accessing swimming as part of their options programme. This involves them travelling on a public bus to different leisure centres around the local area and using swimming vouchers that we have accessed through Redcar Council. Pupils in the primary department are able to receive instruction in Rebound Therapy in many different classes as they progress through the school, and many achieve all 10 levels of the School’s Award Scheme. Currently, Class 6 have two timetabled hours of Rebound. Trained staff lead all Rebound Therapy sessions, and the KHS policy for Rebound Therapy is followed. Pupils in EYFS and the primary department and some chronologically older children, who are developmentally young, also benefit from structured access to our special resources. Groups gain valuable exercise and play skills in the Ball Pool, in the Soft Play area, and on the school’s outdoor play equipment. In fine weather, groups are taken over to the local park to use the play equipment there. The local woods and fields enable younger pupils to go for walks with their teachers, and older pupils to have experience of supervised cross-country running. The woods also provide a safe but challenging setting for “adventure” activities for children of all ages; ranging from a “teddy bear hunt” to orienteering activities.